BPSU President Jason Hayward will be the guest speaker at the Labour Day Banquet on Friday, September 4, 2015 at the Fairmont Southampton Hotel. The announcement said, “BIU President, Brother Chris Furbert and the Executive Board is delighted that Brother Jason Hayward, President of the Bermuda Public Services Union has accepted the Union’s invitation to address attendees at this year’s Labour Day Banquet which will be held on Friday, September 4, 2015 at the Fairmont Southampton Hotel. Brother Jason will address this year’s Labour Day theme,“Leadership by Example” during his keynote address. “Brother Jason Hayward is a committed trade unionist and currently serves as the first elected full-time President of the Bermuda Public Services Union [BPSU]. In June 2015 he was also appointed as Treasurer of the BPSU. “Mr. Hayward serves as the 1st Vice President of the Bermuda Trade Union Congress, an executive of the Caribbean Public Services Association, a leader of the People’s Campaign for Equality, Jobs and Justice and holds a seat on the Board of Directors of the BIU Credit Union. “Upon graduation from the Berkeley Institute, Brother Jason attended the Bermuda College and graduated with an Associate degree in Arts & Science. “He then attended Mount Saint Vincent University and graduated with a Bachelors of Business Administration. 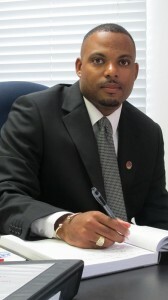 Mr. Hayward also possesses a Masters of Business Administration in Finance from Nova Southeastern University. “Prior to March 2015, Mr. Hayward spent 11 years working within the Bermuda Government Department of Statistics producing outputs such as the Gross Domestic Product [GDP], the Retail Sales Index [RSI], the Balance of Payments [BOP] and the Tourism Satellite Account [TSA]. “He is an alumnus of the Canada – Caribbean Emerging Leaders Dialogue [a Commonwealth leadership development program], holds a Level 7 Certificate in Strategic Management and Leadership from the Chartered Management Institute and formally served as an Executive and Management Officer of the North Village Community Club between 2007 – 2014. “Tickets for the Labour Day Banquet are available at $100.00. Persons interested in purchasing tickets for the banquet should contact Sister LaVerne Furbert at 292-0044 or by e-mail at lfurbert@biu.bm. “The Labour Day activities will begin at 8:00 a.m. on Monday, September 7, 2015 with the Swan’s Running Club Annual Children’s Race and Walk which is being sponsored by Lahey Clinic this year. “Prior to the annual Labour Day March which will leave from B.I.U. Headquarters at 11:30 a.m., Bermuda’s trade union leaders will present Labour Day greetings those the assembled audience. The Community Services Federation will give free health screenings during the morning. Actually, it is a fight against those who think they can throw out accusations without reproductions. It would be another matter if he had produced an actual evidence, however, their own ‘revealing emails’ actually support the government. It is only if you limit yourself to the few selected snippets that were deliberately released without the full email context, that you can create an illusion of impropriety. The fact remains that Minister Richards has done more to preserve CS jobs than their own unions. Don’t you mean without “repercussions” smarty? Nothing of the sort. That is what union leaders would like you to think. the more the bogeyman mentality is in your head, the better off they are going to be. Thank God for African Bermudians who sacrificed and fought for years for this Holiday. Stand firm Jason your elders who paved the way before you, went through worse and are proud of you. Keep up the good work brother Jason, If the Government is funding legal actions; THE PEOPLE OF BERMUDA WOULD BE FUNDING YOUR FIGHT. Make no illusion this is personal. So you think your ‘leader’ has the right to pay for air time and throw around baseless accusations and the accused should just take it lying down? I heard the TV station had to apologise for the broadcast, but because you are part of a Union you believe you are above such responsibilities and decency? I’m sure it is personal also for the individual your ‘leader’ slandered as well. I wonder if he got paid for doing that broadcast too, and by whom. Funding his fight and his fat paycheck that i am sure you would love to collect!!!! Yup, dont forget about Hanbury. Oh boy, can’t wait to read the transcript of this speech. Bound to be a hate-filled gem! President and Treasurer of the BPSU. Doesn’t anyone see a conflict here. My thoughts exactly… does this mean he is collecting 2 pay checks from the BPSU? Not mine or taxpayer dollars, that is up to the BPSU membership. Ever think why the unions have been loose and light about submitting proper financial records to the authorities for auditing? Where have we see this before hmmmmmmmmmm Leader of public body and the finance function. Now remind me how that worked out. Smooth as a machine full of well greased cogs! I like this, folk AFRAID of strong minded Black Leaders who dont give a S! @# about the powers that be, whats sad is some Black folk are afraid too. Dont worry those fearful days are over, its all in your minds. Speak the TRUTH Bro, the young bloods need to hear it. Jason , tell them exactly what you think ! Tell them to get rid of Dunkeley , tell them we want Gordon -Pamplin for Premier ! Who you really want and who that would really be is the thing. I took my dues out of the BPSU after the election of Jason Hayward. He clearly does not represent workers and aligns himself too politically to serve any real labour interests. I cringe to know he will be given another platform to rant about the Government. You’re just a weak minority, Labor has and always be political, just like in United States,England and Canada,only difference is Whites in Bermuda are not vocal and active like their cousins overseas. This will be like a high school pep rally. Lots of rah rah, foot stomping, cheering & clapping but little substance except for the message that has come from an island to the north. Like being Premier and Finance Minister,big deal. Let me guess, all we Bermudians are being taken advantaged of by them America’s Cup people! Furbert must secretly hate Hayward lol, a smart educated union leader who can speak English. Fold the BIU and move the workers over to the BPSU! The BIU continue to darken the image of the union movement in Bermuda through incompetence and complete lack of effort to build up the Bermuda workers through training and evaluation. Union talking heads will never admit it but the BIU workers would be 100 times better off over with us in the BPSU. Actually I doubt furbert is worried at all. Seems to me he is giving young blood here enough rope to hang himself. And I promise you when he does the BTUC will sit back and smile.